“You’re different,” he said, touching my face. Wow, Gideon Cross, I was seriously worried for you after the end of the last book. After doing what was necessary would this be the one demon that would sink him after everything else he is plagued with in life. But I needn’t have worried, he is strong and does what needs to be done to ensure his and Eva’s safety, even if that meant not being together. Their self-imposed separation does not last long thank god, even though Eva thinks it is for real, once the heat is more or less off Gideon makes haste in showing Eva that he is not out of her life, even if that means a bit of cloak and dagger by moving a bit closer to home. As we know their relationship is sizzling off the charts chemistry and that is in this book in spades…there is a lot but is always something different so not repetitive at all just hot and totally smoking…I am surprised my kindle didn’t spontaneously combust. We do get a few answers in this book, but a lot more are created and some are still not answered, I would of liked to have at least some of the earlier ones answered as it seems like I have been waiting forever!! A lot happens in this book so it kept the story ticking over nicely, the usual suspects are in this book to keep it interesting, Corinne being one of them, at one point my heart was in my mouth with a “oh know surely not, please no, no, no, no, no, no” screaming session at the kindle!! I can’t wait for the next book, especially after this one ended so abruptly, although it is not a cliff hanger it just ended, just when things were beginning to get interesting and I was more disappointed than anything else. I just wasn’t ready for the story to finish yet, I wanted more. 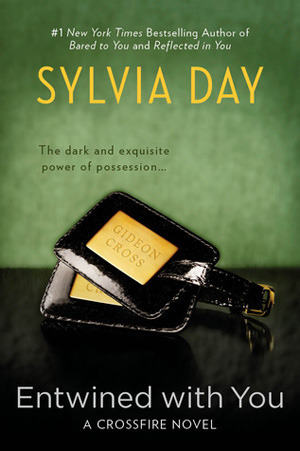 I have seen the reviews and comments that have been floating around and my heart goes out to Sylvia Day, the publishers have caused this not her. If you care to read her heartfelt posts on her blog and other social media sites you will see that her initial contract was for 3 books and it was never her intention to keep this story to a trilogy, once the 3 book contract had come to end another contract has been made for the rest of the series. The decision to push the book back was her publishers, not hers and she is going to ensure that this does not happen again. Whatever the reason, there is no way on earth this book deserves a 1 star review and I sincerely hope that some peoples negatives do not detract others from continuing on this journey with Gideon and Eva, if you have been swayed you are sorely missing out on a beautiful story.